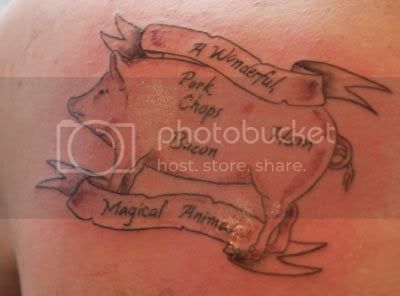 Nothing proclaims your undying love for bacon more than permanently tattooing it on your body. 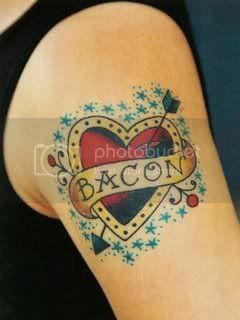 I've come across some great bacon tattoos (and some not so great ones) that I've compiled for our collective enjoyment. Click on the pics to go to the websites where you may be able to find more information on these works of art. **UPDATE! 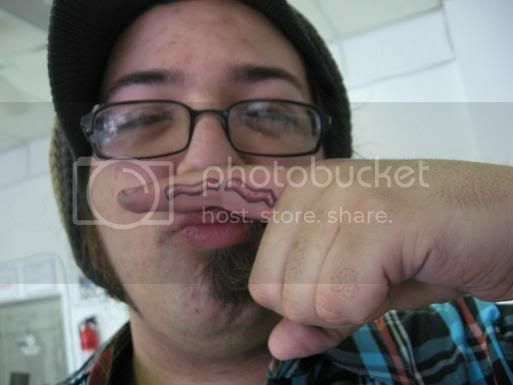 : Tat owner identified! 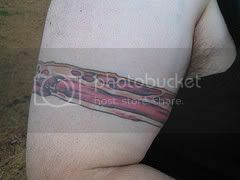 The Hamzinger found his bacon armband here and I gotta give him props as this is one of my very favorite bacon tattoos. He is a member of the awesome & funny cover band The Misfats. Jill Barron, executive chef at De Cero, a Mexican restaurant in Chicago, likes to express her love for food indelibly -- on her lip, among other places. There are a few more but I'll save those for part 2. If you find any bacon or pork related tattoos that you think I should feature, please email me the link at skullsandbacon (at) gmail.com. 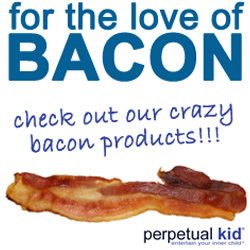 So you can have bacon in the event of an apocolypse. Awesome! Get The F Outta Here. 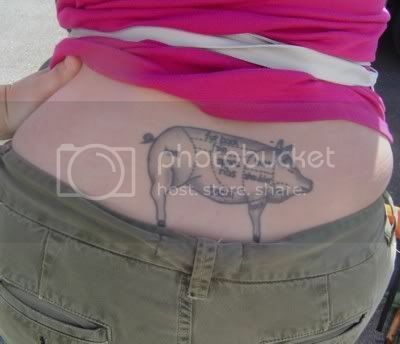 Sure beats the FM tramp stamp some women have just above their butts. I don't think the second one down is supposed to be bacon, I think it's supposed to be what it would look like if the tribal or barbed wire tattoo was skinned off. those are some of the dumbest tats yet, and almost every tattoo inked since 1992 has been bad! 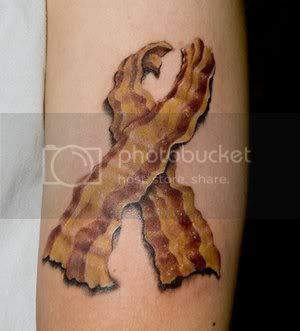 #2 is mine and it is most definitely a band of bacon, stretching 'round my fatty bicep. It's been confused before, tho', so it's understandable. In person I'll raise my arm up so you can see the 2 ends coming together. Got it when I was singing in The Misfats from tattoo-extraordinaire Dan at Atlas Tattoo in Portland, OR. LOL!!! the brainy breakfast crack me up..